Samsung today released two of its highest-capacity SSDs for consumers. The drives are based on the M.2 "gumstick" form factor, which is quickly being adopted in the latest ultra-thin notebooks and PCs. The new 960 Pro and 960 EVO SSDs are based on the ever-more popular non-volatile memory express (NVMe) specification and Peripheral Component Interconnect Express (PCIe) Gen.3 x4 lane motherboard interface. The 960 Pro sports blazingly fast sequential read/write speeds of up to 3.5Gbps and 2.1Gbps, respectively. The 960 EVO has sequential read/write rates of 3.2Gbps and 1.9Gbps, respectively. A front and rear view of the 960 EVO SSD. Samsung said the 960 series is ideal for intensive workloads such as computer-aided design, 4K rendering, data analysis, engineering simulations and gaming. The 960 PRO will come in capacities of 512GB (MSRP - $329), 1TB ($629) and 2TB ($1,299). The 960 EVO comes in 250GB ($129), 500GB ($249) and 1TB ($479) versions. Both SSD models are equipped with Samsung's TurboWrite technology, which the company first unveiled in 2013 in its 840 EVO internal 2.5-in SSD. TurboWrite creates a high-performance write buffer to which new data is first written to high performance single-level cell (SLC) NAND flash and later moved to multi-level cell (MLC) flash. In addition to its record-breaking performance and capacity, the 960 Pro SSD boasts the greatest endurance Samsung has ever produced for an M.2 form factor SSD; it's able to accommodate up to 1.2 petabytes (1,200 gigabytes) worth of writes over its warrantied lifetime. The 960 EVO can withstand up to 400TB of writes over its warrantied lifetime. The 960 Pro comes with a 5-year limited warranty and the 960 EVO has a 3-year limited warranty. Samsung's new 960 Pro and 960 EVO M.2 SSDs. Both SSD models sport Samsung's new Polaris controller, with the company's new SM951 NVMe SSD last June, and has an eight-channel chip packed with five processing cores. The new controller, combined with the NVMe interface, allows the 960 Pro to deliver peak sequential read and write transfer speeds of 3,500 MB/s and 2,100 MB/s, respectively, and random read and write I/Os per second of up to 440,000 and 360,000. The 960 EVO has sequential read/write speeds up to 3,200MB/s and 1,900 MB/s, respectively, and random read/write speeds up to 380,000 and 360,000 I/Os per second, respectively. 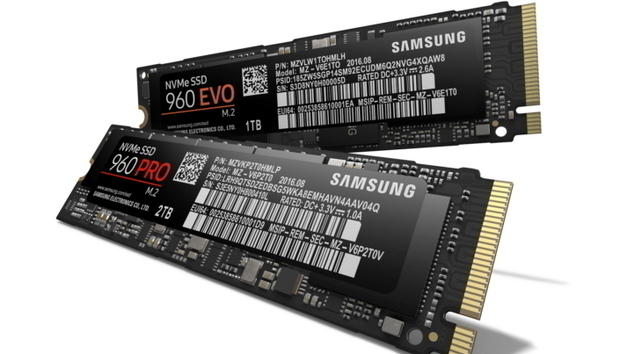 Samsung began using the NVMe specification last year with the introduction of its 950 Pro SSD. NVMe is a a logical device interface specification for accessing non-volatile storage, such as NAND flash, via the high-speed PCIe bus. The PCIe bus allows non-volatile storage to be directly connected to a computer's motherboard versus more traditional interfaces, such as serial ATA (SATA), which require a data translation layer and creates additional I/O latency. On the 960 Pro and 960 EVO SSDs, Samsung is also introducing the fully rebuilt Magician software with a new user interface, with which users can control various SSD settings including firmware updates. In May, Samsung announced it had begun mass-producing the world's smallest 512GB PCIe-connected SSD that also used the NVMe specification. Earlier this year Samsung released its smallest 512GB PCIe-connected SSD, the PM971, which is just 20mm x 16mm x 1.5mm in size and weighs only about one gram. Samsung's PM971-NVMe SSD was aimed at ultra-thin notebooks and was manufactured by combining 16 of Samsung's 48-layer, 256-gigabit (Gb) V-NAND flash chips, one 20-nanometer 4Gbit LPDDR4 mobile DRAM chip and a high-performance Samsung controller. The 960 PRO and 960 EVO SSDs are also based on Samsung's 48-layer V-NAND-based NAND flash, which stacks cells one atop another like a microscopic skyscraper for greater density and performance. "We were proud to erect the NVMe era last year with the introduction of our 950 Pro SSD," Un-Soo Kim, senior vice president of Samsung's memory business, said in a statement. 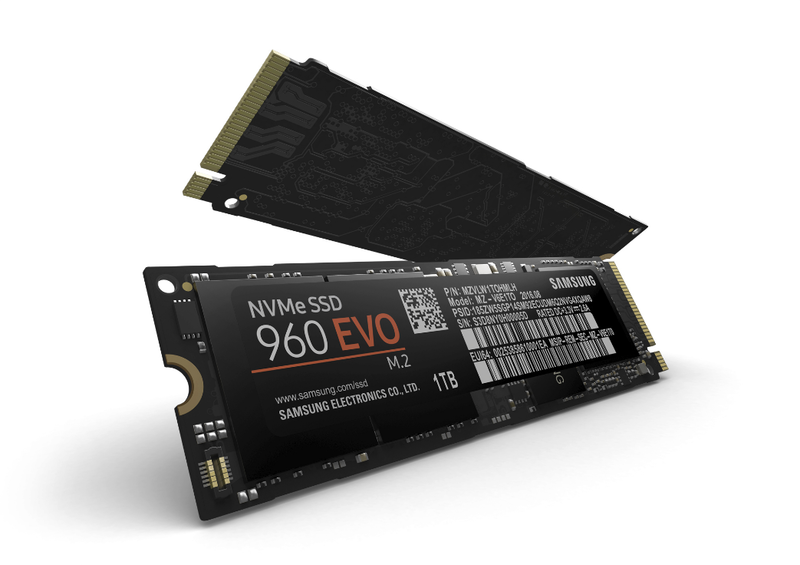 "Now, with the introduction of the NVMe 960 PRO and 960 EVO SSDs, Samsung is once again taking the next step in the multi-terabyte SSD technology and the storage revolution, providing users higher capacities and speeds than ever before within an NVMe PCIe drive to create new possibilities for consumers and business professionals."